This week's Make It Thursday may not be one you can make at home (unless you own a Cricut or similar product). I bought a Cricut last year to make lots of projects for school. 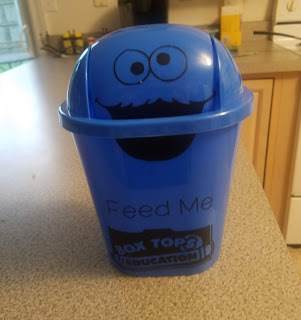 One of the projects I had in mind was to make a cute container for my Box Top Labels. I have seen so many cute ones and was definitely envious! Now I have my own! 1. Cut out the pieces on the vinyl. 2. Use transfer tape to put the pieces on the garbage can.